The tiny Greek island of Kastellorizo (otherwise known as Megisti) is the most remote part of the Dodecanese archipelago. It is situated directly off the Turkish town of Kas and is a gem with some impressive highlights. Kastellorizo has an exceptionally beautiful harbour which is a popular destination for many day trippers from Turkey. Then there is the so-called “Blue Grotto”, a cave that is 75m deep and 35m high that is only accessible by boat. In the light of the morning sun the grotto shimmers in a deep blue, just perfect for a swim. Kastellorizo offers a wide variety of flora and fauna to its visitors. Nature is hardly disturbed by around 300 inhabitants and a handful of tourists, and there is a sizeable population of turtles, seals and dolphins. There are practically no roads in the capital, and the only means of transport consist in the island coach and ‘the’ island taxi. Almost miraculously, Kastellorizo has a small airport that is served by Olympic Airways from Rhodes. Transfer by ferry boat is a fairly lengthy procedure due to the remoteness of the island. Kastellorizo offers very attractive accommodation around the picturesque harbour that is also lined with taverns, bars and cafes that can certainly keep you entertained for several days. Kastellorizo is accessible by plane with Olympic Airways (about 45 minutes’ flight from Rhodes) or by ferry, also from Rhodes. Kastellorizo is the only village on the idyllic little Dodecanese Island of the same name. 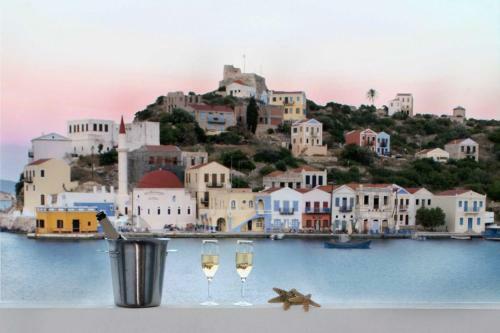 Kastellorizo’s 300 human inhabitants leave plenty of space for other creatures like water turtles, dolphins and seals. Apart from taking incredible nature photos, tourists can enjoy the peaceful atmosphere of the little harbour, watch the fishermen mending their nets and enjoy traditional Greek food in one of the restaurants or taverns. It is the perfect place for a family holiday where the children can safely play on the beach.